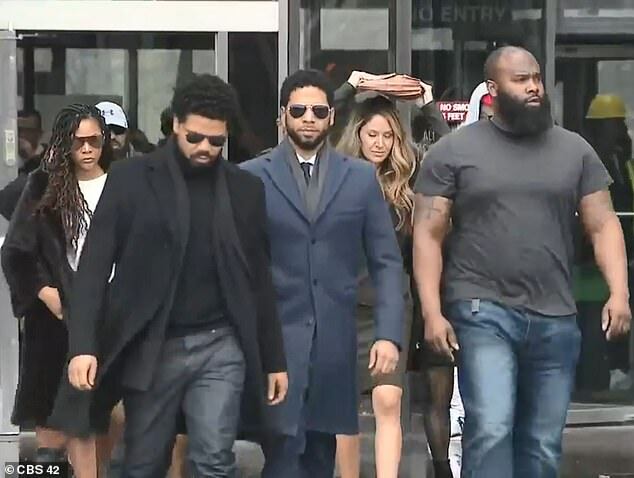 After pleading not guilty on all counts, Smollett left the court with his family without making a statement. On Thursday, Tina Glandian, one of his attorneys said they 'welcomed' the case being open to the public and media. 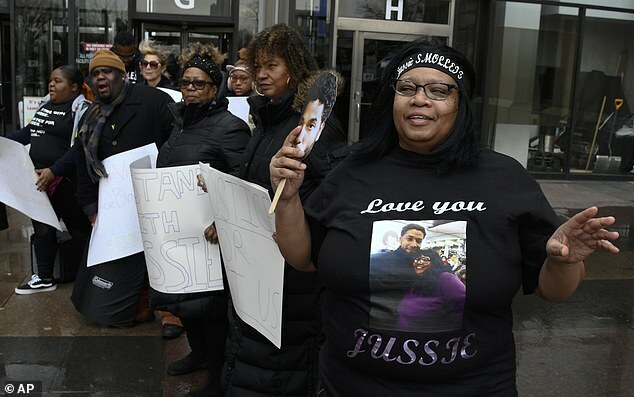 'We welcome cameras in the courtroom so the public and the media can see the evidence and we believe is a lack of evidence against Mr. Smollett and we look forward to complete transparency and the truth coming out,' she said. The judge granted Smollett permission to travel to California and New York, where his legal team has offices, to meet with them but said he must notify pre-trial services 48 hours before and 24 hours after he returns from any trips. Glandian was accompanied by two other lawyers from Mark Geragos' firm. Geragos is a celebrity favorite who has represented Chris Brown and Michael Jackson in the past. He has spoken publicly since Smollett's indictment to claim he is the victim of a prejudiced media and police department. The police department insists its investigation has been above board. 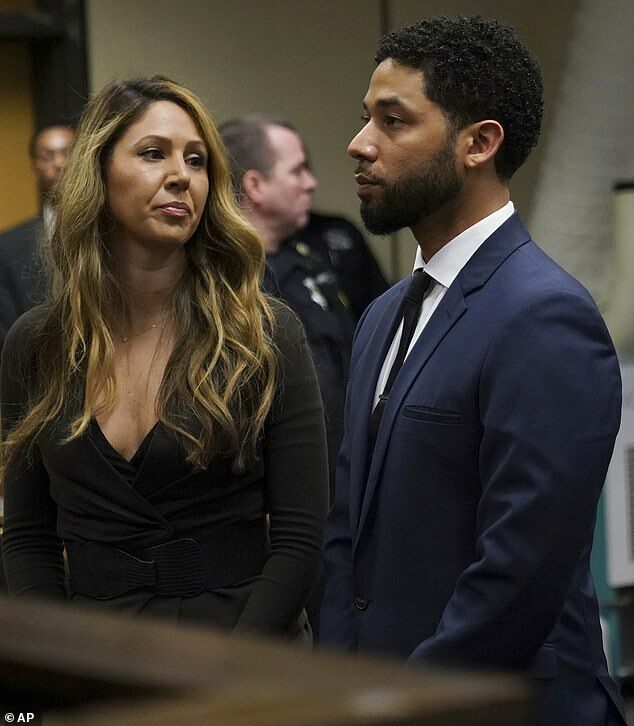 Members of Smollett's team told the media at the courthouse that his Empire co-star Terrence Howard had planned to attend the arraignment but that his flight was delayed arriving in Chicago. They said he would likely attend later sessions. 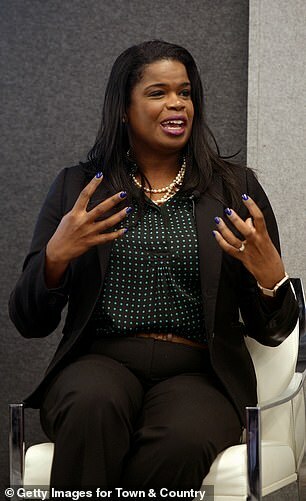 Smollett's court appearance coincided with the revelation that his family contacted former Michelle Obama aide Tina Tchen to get in touch with State's Attorney Kimberly Foxx the day after the attack to tell her they had 'concerns' with how the police were handling it. They were worried, they said, about the amount of information that was being leaked to the media from the start of the investigation. Tchen persuaded her to try to pawn the case off to the FBI, according to text messages obtained by USA Today. Foxx said she was 'trying' and had spoken to Chicago Police Superintendent Eddie Johnston to try to 'convince' him to let the FBI take the lead on the investigation. 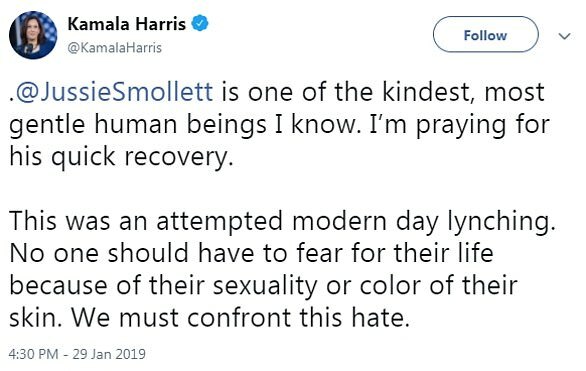 She also exchanged text with one of Smollett's relatives who replied: 'Omg this would be a huge victory,' when Foxx mentioned her efforts. 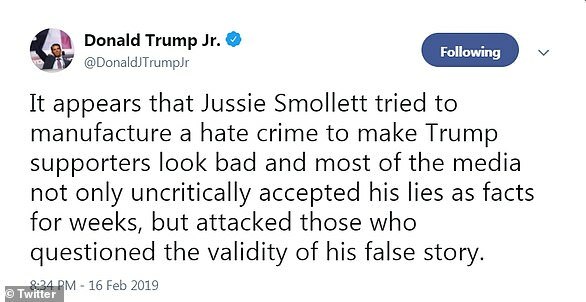 Ultimately, the case did not move on to the FBI because there was not enough evidence that Smollett had been the victim of a hate crime as he claimed. 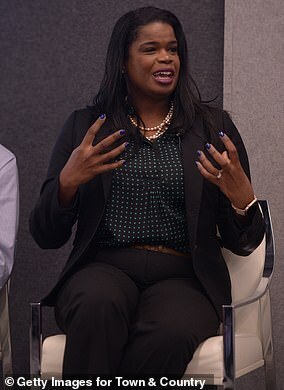 Foxx recused herself from the case after Smollett was arrested, saying at the time that her contact with a family member of his was a conflict of interest in the case. 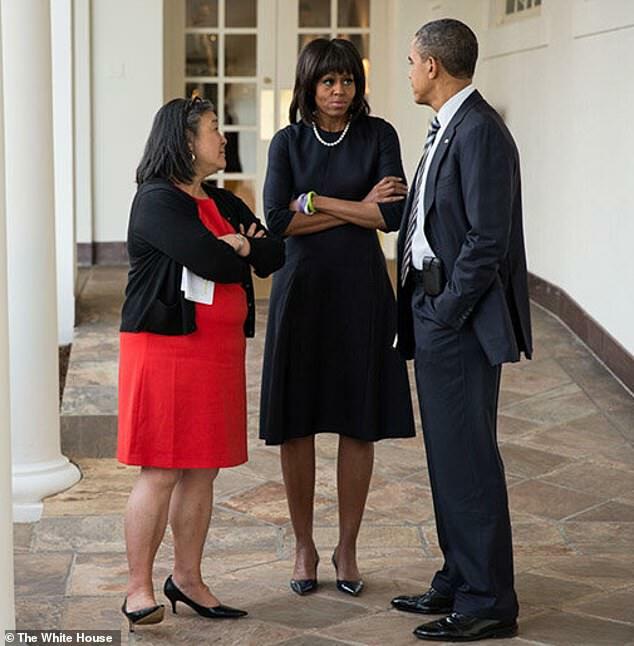 Tchen, who worked with the Obamas when they were in the White House, has not publicly commented on the case. Smollett did not initially want to involve the police on the night of the attack. It was his friend, 60-year-old Frank Gatson, who insisted they call 911 after he arrived back at his apartment with a rope around his neck and bleach on his clothes, claiming to have been assaulted by two men who shouted: 'This is MAGA country!' as they beat him. It was 2am and he had gone out to get a salad from Subway. In the weeks that followed, Chicago PD sources gradually leaked information about the case to local media about how Smollett was refusing to hand over his phone records. As they combed through surveillance footage from the night of the attack, they honed in on the Osundairo brothers and tracked their ride share and taxi movements. They then arrested the pair on February 20 as they arrived back in Chicago from Nigeria. In the 47th hour of their 48 hour hold, the brothers confessed to the plot. 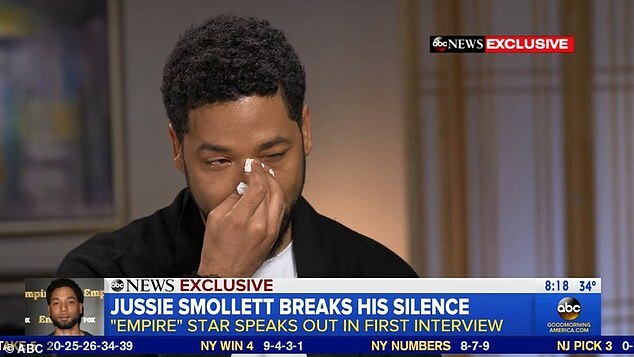 At around the same time, Smollett went on Good Morning America to plead his innocence and condemn the growing skepticism surrounding his case. Jussie Smollett has been hit with an additional 15 counts of filing a false police report by a grand jury and is now facing up to 48 years behind bars. The Empire actor was initially charged with one Class 4 Felony charge of disorderly conduct last month but a grand jury has applied that charge 15 times over in an 36-page indictment that was returned on Thursday. Now, he is facing a maximum sentence of 48 years behind bars and fines of up to $400,000. He is expected to cut a plea deal with authorities, according to experts cited by ABC. Neither Smollett's legal team nor Cook County prosecutors have commented on the new indictment which was first reported by CWB. We obtained a copy of it this afternoon. It divides the 15 new charges into two sets. Counts one to seven apply to the comments he made to police officer Muhammed Baig, who first responded to his apartment when his friend called 911 on January 29. The second set applies to Detective Kim Murray who interviewed him later that day. She is who Smollett told, according to the indictment, that one of his attackers was a 'white male'. He told Baig that he had been attacked by two 'unknown males' who were dressed in black. One was wearing a ski mask and they called him 'racial and homophobic slurs', he said. Smollett told Baig they hit him 'about the face' with their hands and poured an 'unknown chemical substance' onto them. The actor has not been charged for allegedly sending himself a threatening letter days before the attack, as police have alleged. 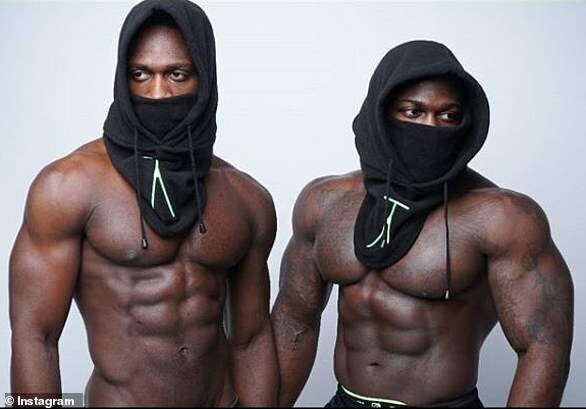 Smollett is accused of hiring brothers Abel and Ola Osundairo to beat him up outside his apartment on January 29 in what he later described to police as a racist and homophobic attack. 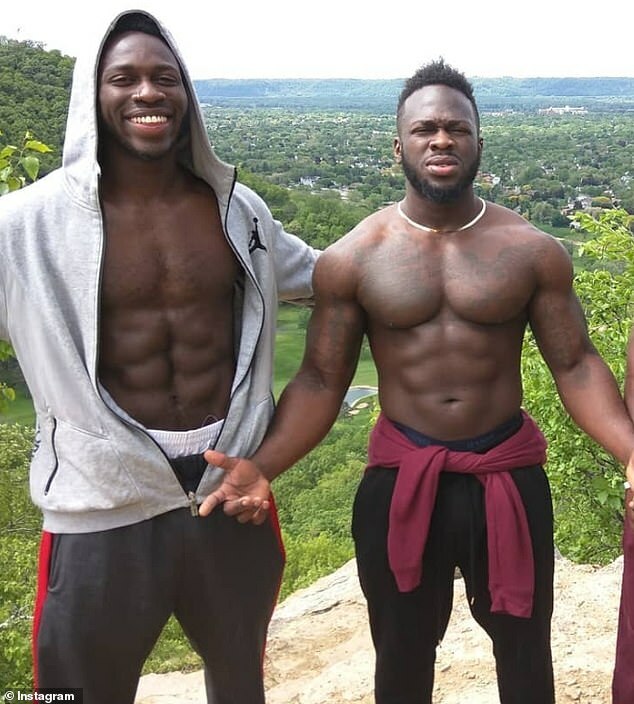 The brothers say he paid them $3500 to do it and that he promised them an additional $500 which they would get when they came home from a trip to Nigeria. They say Smollett's motive was that he wanted a higher salary on Empire. 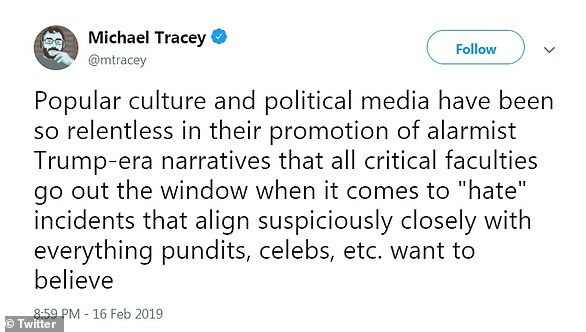 The actor went on Good Morning America before he was arrested where he cried and insisted he was telling the truth amid a swelling tide of public cynicism. Fox has said it is 'considering its options' in light of Smollett's arrest. He will not appear in the final two episodes of Empire that are to be shown later this year. On Friday, after the indictment was returned, the network declined to comment. The actor's lawyers say he has been the victim of police and prosecutorial misconduct. They say his presumption of innocence was 'trampled' and that the entire investigation into the attack has been flawed. A new day brings another new twist in the Jussie Smollett hate crime investigation. The Nigerian brothers who police claim helped orchestrate the “attack” last month in Chicago reportedly made homophobic statements on Twitter that some believe could be used in the singer’s defense. Another tweet read: “YOU’RE GAY THATS WHO YOU ARE.” It’s unclear who Ola was referring to in that tweet, the report states. 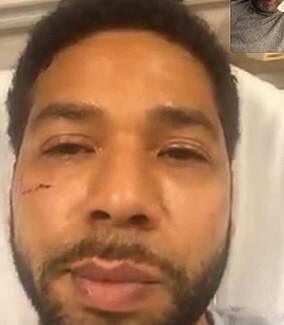 Smollett’s defense team may be able to use these posts to support the Empire star’s claim that he was attacked by two masked men who hurled racial and homophobic slurs at him and tied a rope around his neck. The offensive tweets contradict statements the brothers previously made publicly after being interrogated by the police. “We are not racist. We are not homophobic, and we are not anti-Trump. 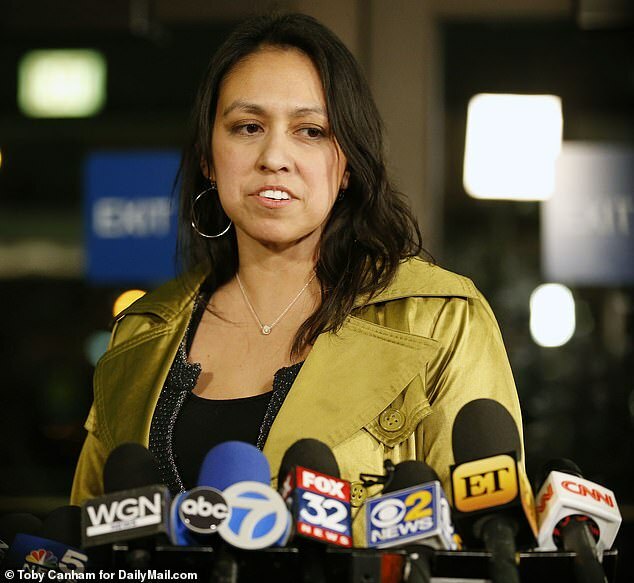 We were born and raised in Chicago and are American citizens,” they said in a joint statement. 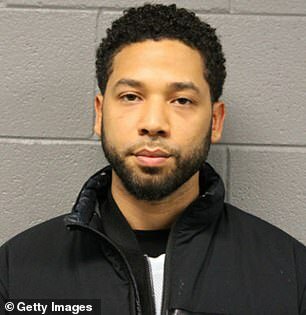 Smollett charged with filing a false police report of a hate crime. 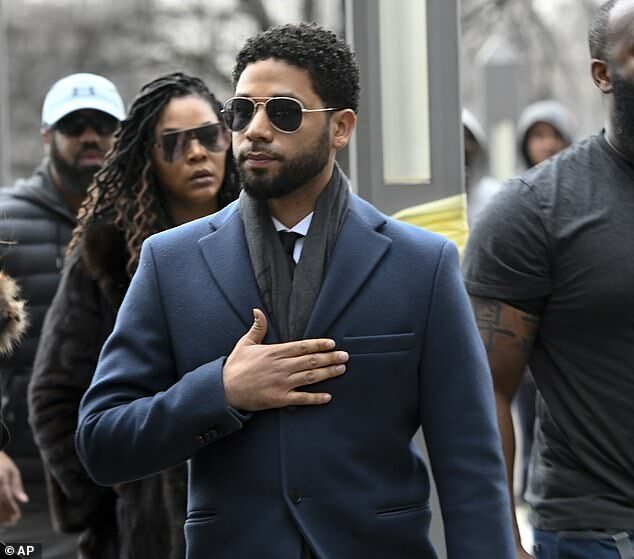 Smollett, who had to surrender his passport, is free to travel only to New York and California to meet with his legal team, Page Six reports. Meanwhile, Chicago police chief Eddie Johnson claims the singer paid the brothers $3500 to participate in the elaborate hoax because he was upset with his Empire salary. Chief Johnson went on GMA yesterday to elaborate on the investigation and defend its notoriously brutal police force. "The events of the past few weeks have been incredibly emotional for all of us. Jussie has been an important member of our EMPIRE family for the past five years and we care about him deeply. While these allegations are very disturbing, we are placing our trust in the legal system as the process plays out," said a statement signed by Lee Daniels, Danny Strong and five other producers. "We are also aware of the effects of this process on the cast and crew members who work on our show," they continued, "and to avoid further disruption on set, we have decided to remove the role of 'Jamal' from the final two episodes of the season." 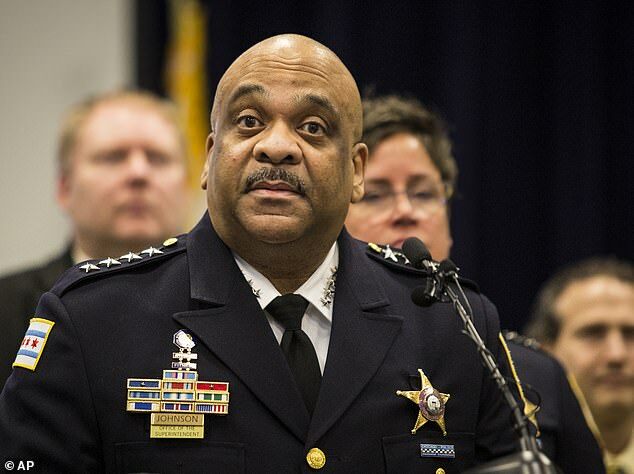 The announcement follows a Thursday news conference in which Chicago Police Superintendent Eddie Johnson said that Smollett had staged the apparent hate crime he reported last month. The incident — which Smollett allegedly faked with the help of two brothers whom he paid $3,500 — was orchestrated "because he was dissatisfied with his salary," Johnson explained. The police superintendent said Smollett carried out the "stunt" after a racist and homophobic letter he received a week earlier, which he allegedly also faked, had failed to get the attention he desired. "So," Johnson concluded, "he concocted a story about being attacked." "Today we witnessed an organized law enforcement spectacle that has no place in the American legal system. 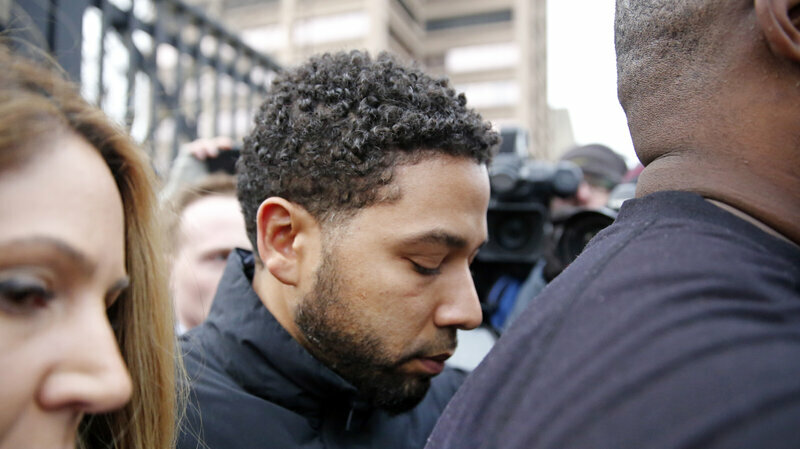 The presumption of innocence, a bedrock in the search for justice, was trampled upon at the expense of Mr. Smollett and notably, on the eve of a Mayoral election," his lawyers said in a statement Thursday. 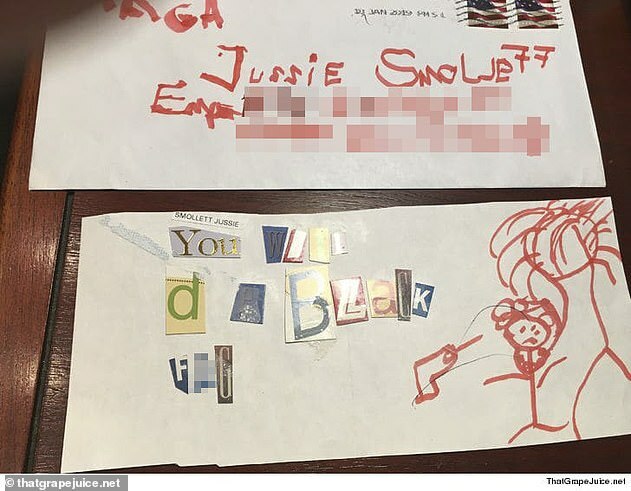 Police say that on January 22, Smollett mailed himself a threatening letter to the Empire studio in Chicago which had 'MAGA' written on it and included racist and homophobic slurs. When that did not win him a pay rise from 20th Century Fox, he allegedly hired the brothers to attack him at 2am on January 29 in what he then told police was a racist and homophobic attack. They punched him but Smollett gave himself the scratches on his face that were visible in a hospital-bed selfie he took after reporting it to police, the Superintendent said. 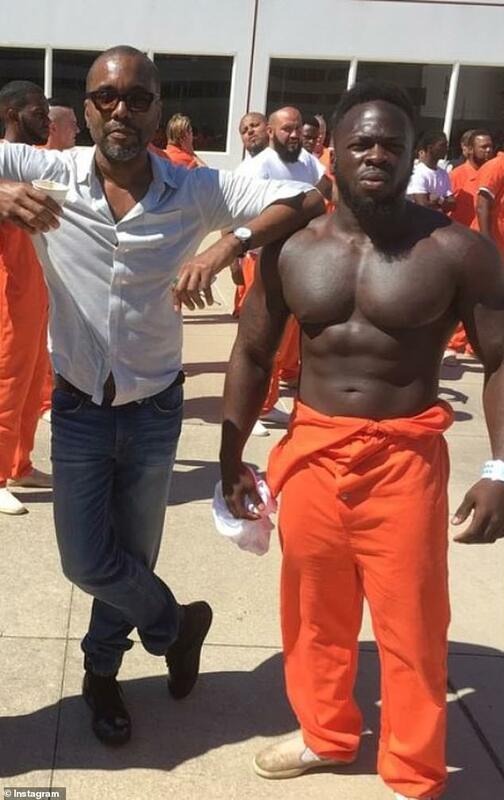 While Smollett received an outpouring of sympathy from politicians, celebrities and public figures around the world, the brothers fled to Nigeria afterwards. They were tracked down through their use of taxis on the night of the incident and were picked up when they returned to Chicago on February 13. Once in custody, they told police that Smollett had hired them and said it was because he wanted a higher salary. He paid them a reported $3,500 to carry out the attack, they said, and promised them $500 more when they returned. Smollett is in custody awaiting his first court appearance on felony charges of filing a false police report and disorderly conduct. He will appear before a judge at 1.30pm. 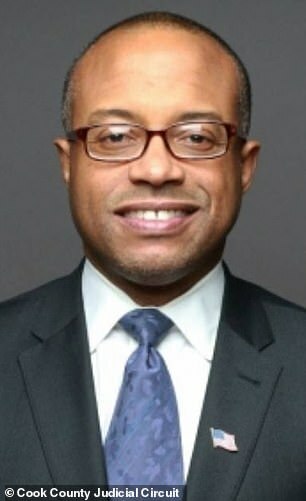 During the press conference, Superintendent Johnson revealed Smollett went from being treated as the victim in the case to a suspect when the brothers 'confessed' the 'entire plot' in the final hour of a 48 hour hold. That is when they, in their lawyer's words, 'manned up' and revealed that they had been hired to carry out the attack by the actor himself. Smollett actually furthered the investigation along by going on Good Morning America and confirming that the two people in a grainy surveillance footage still were the men who attacked him. He was unaware when he made the remark that Chicago PD had identified those men as the Osundairo brothers and that they had them in custody. 'I come to you today not only as the Superintendent of Chicago Police Department but as a black man who has spent his entire life living in the city of Chicago. 'I know the racial divide. I know how hard it has been for our city and our nation to come together. 'Empire actor Jussie Smollett took advantage of the pain and anger of racism to promote his career. 'I'm left hanging my head and asking why? Why would anyone, especially an African American man, use the symbolism of a noose to make false accusations? 'How could someone look at the hatred and suffering associated with that symbol and see it as an opportunity to manipulate his own public profile?' Superintendent Johnson said, adding it was a 'slap in the face ' to 'everyone' in Chicago. Smollett has not made any statements since he was taken into custody. His lawyers said on Wednesday night that he would fight the charges with an 'aggressive defense'. In previous statements, his representatives have angrily hit out at the media and insisted that he is the victim. 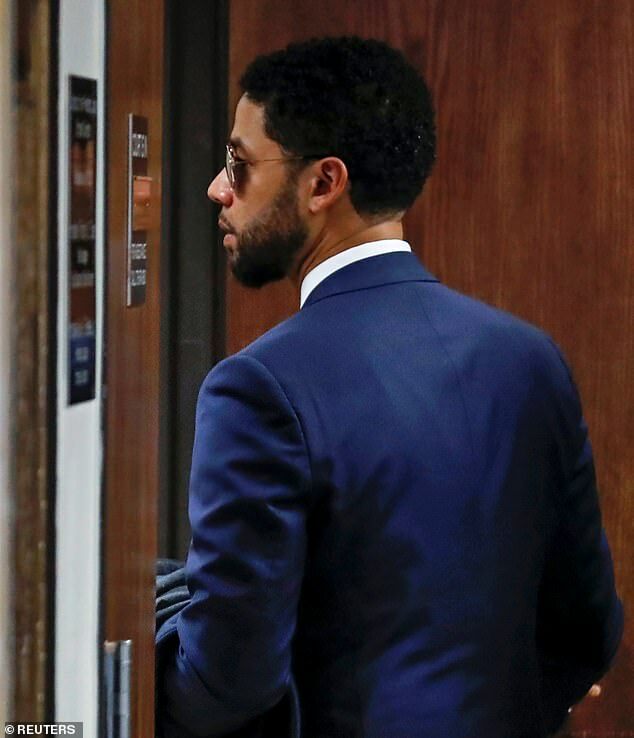 Within hours of him being charged, Smollett's attorneys arranged for him to hand himself in quietly at Chicago's 1st District afterwards. He appeared in his mugshot wearing a black puffer jacket, staring blankly at the camera. After being processed at the station, he was transferred to the Cook County courthouse where he will appear at 1.30pm. He is being held separately from other detainees. 20th Century Fox, which released a statement hours before he was charged to say it was standing by him, is now reportedly suspending the actor. A press conference is scheduled for 9am CT during which detectives will give more details about the arrest. It is not yet known where he was or what time he was taken into custody. 'Like any other citizen, Mr. Smollett enjoys the presumption of innocence, particularly when there has been an investigation like this one where information, both true and false, has been repeatedly leaked,' the actor's attorneys Todd Pugh and Victor Henderson said. The Osundairo brothers testified before the grand jury for about two and a half hours on Wednesday. Addressing reporters outside afterwards, their attorney Gloria Schmidt said they'd 'manned up' by speaking out against Smollett. 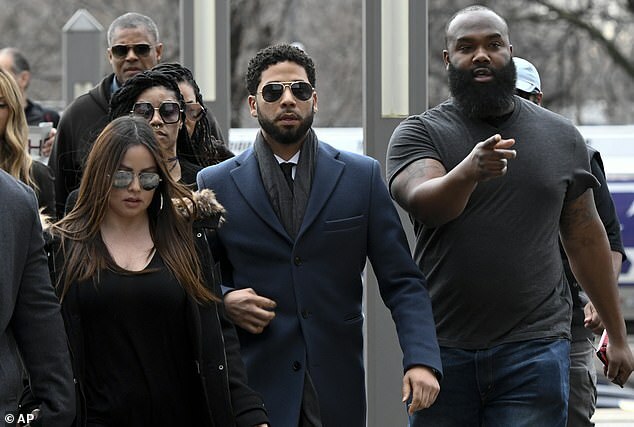 They have not been arrested or charged and their lawyer said they had not been offered any form of immunity deal in exchange for testifying against Smollett. 'There was a point where this story needed to be told, and they manned up and they said: "We're gonna correct this." She said that Smollett was lying, and that she didn't know how his conscience could let him sleep at night. 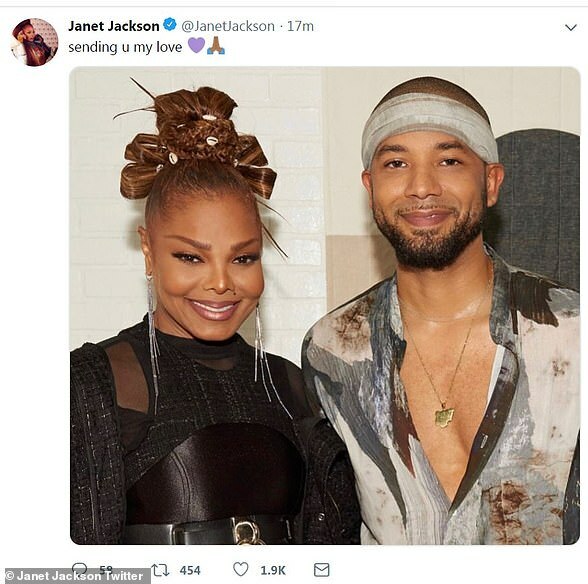 There was a point where this story needed to be told and they manned up and they said, "we're going to correct this"
'I think Jussie's conscience is not letting him sleep right now and he should unload that conscience and come out and tell the American people what happened,' she added. 'I think the biggest thing for the American people to know. Is that this story, has a lot of complications to it. 'We're not trying to hide anything from the press. 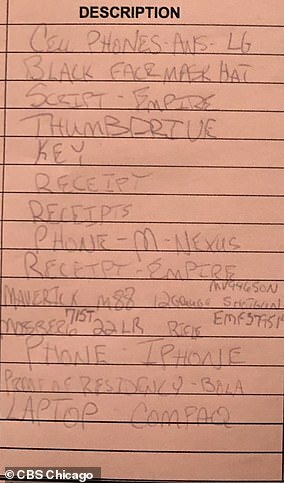 But we wanted to make sure that everything checked out. 'When I say that the police spent countless man-hours trying to piece this together, I mean that, I absolutely mean that. 'When I say that my clients spent countless hours getting their story out there to the police so that they could do their work, I mean that, too,' she said. The brothers' testimony came after footage emerged of them buying ski masks, a red hat and gloves in a store the day before the attack. 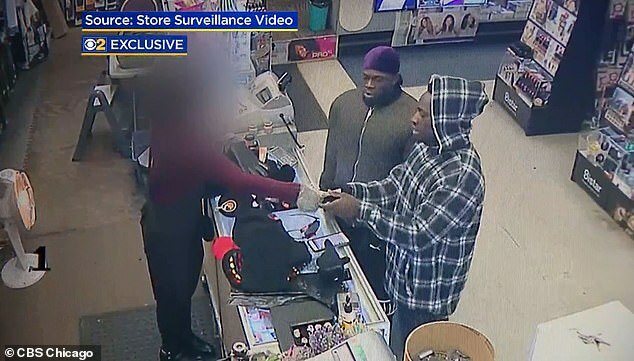 It was taken on January 28 and shows brothers Abel and Ola Osundairo inside what looks like a drug store buying the masks and one hat. 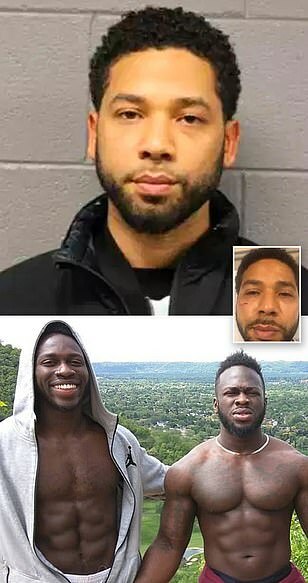 Smollett told police that he was attacked by two masked assailants who punched him, poured bleach on him, tied a noose around his neck and called him 'Empire n****r f****t'. No footage has ever emerged of the incident itself. In the video taken inside the store the day earlier, the brothers look calm as they bring the items to the register. Abel, whose full name is Abimbola, is dressed in a blue plaid jacket. About 30 seconds into the video, he puts his hood up while standing at the register. His younger brother Ola, who once appeared on Empire as an extra, is in a green jacket. The brothers were picked up by police at Chicago O'Hare Airport on Wednesday night as they returned from Nigeria. Police seized a red hat from the brothers' home along with ski masks when they raided it last week. Smollett said his attackers were wearing masks but there was not a description of a red hat in the initial reports. Police have since shared their belief that at least one of them was wearing a red hat at the time of the attack. 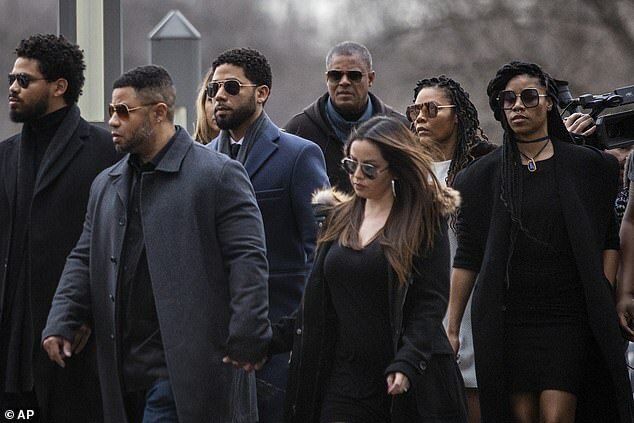 Smollett's family, many of whom are also actors, have spoken out repeatedly in support of him since the January 29 attack as have many of his co-stars on Empire. Fox also insisted that he was not being written out of the show, as had been claimed, and called him a 'consummate professional' in a statement. Smollett's lawyers include Mark Geragos, who has represented Michael Jackson and Colin Kaepernick, in the past. When news of the attack first emerged on January 29 and 30, Smollett was inundated with support across the political spectrum. Among those who tweeted their condemnation of him were Democratic presidential hopefuls Kamala Harris and Cory Booker. But as days went by with no suspects on the horizon, details about the case and the police's investigation into it began to cast doubt on Smollett's version of events. One of the earliest sources of speculation was the fact that Smollett waited 42 minutes to call the police then refused to hand over his phone to the police for them to verify his story. He then handed over redacted files that police described as 'insufficient'. Frustrated with the coverage of his case, he hit out at the media for reporting on leaked information coming from within the Chicago police department and insisted he was the victim. He then went on Good Morning America to protest his innocence. In an hour-long interview with Robin Roberts, he wept as he recalled the attack and abhorred the reaction to it. Choking back tears, he explained when asked why it took so long for him to contact the authorities: 'There is a level of pride there. Later, he added how desperate he was for them to find footage of the attack. 'I want that video found so badly because, for probably four reasons. 'Number one, I want them to find the people that did it. 'Number two, I want them to stop being able to say 'alleged' attack. 'Number three, I want them to see that I fought back,' he continued, welling-up. 'I want a little gay boy who might watch this to see that I fought the f*** back. They ran off,' I didn't,' he said. 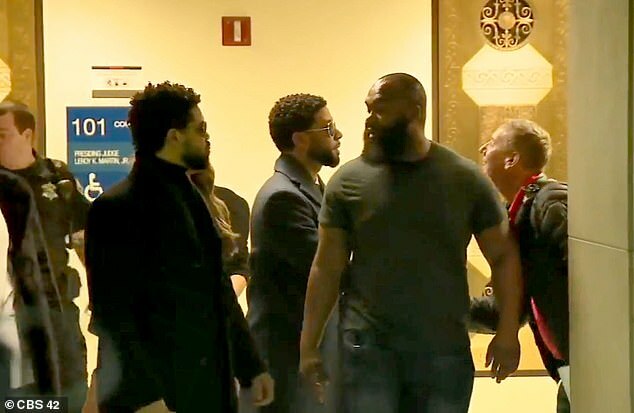 After it emerged that Smollett knew the brothers and may have been involved in the staging of the attack, the celebrities and politicians who rushed to support him walked back their claims. Nancy Pelosi deleted her tweet about it and Cory Booker said he would now be 'withholding judgement' until more information emerged. Kamala Harris said, when questioned about her tweet that it was a 'modern day lynching', that she was 'very concerned'. 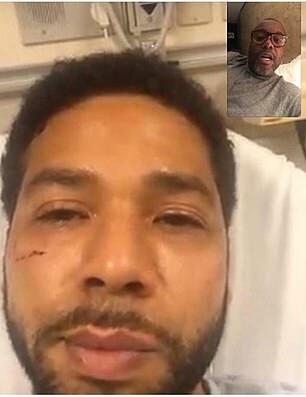 Jussie Smollett tells Chicago police he was physically attacked by two men in downtown Chicago while walking home from getting food from a Subway restaurant at 2am. The black and openly gay actor tells authorities the men used racial and homophobic slurs, wrapped a rope around his neck and poured an 'unknown substance' on him. Smollett told detectives that the attackers yelled he was in 'MAGA country,' an apparent reference to President Donald Trump's 'Make America Great Again' campaign slogan, which some critics of Trump have claimed is a racist dog whistle. Chicago police say they've reviewed hundreds of hours of surveillance camera footage, including of Smollett walking downtown, but none of the videos show the attack. Police obtain and release images of two people they would like to question. 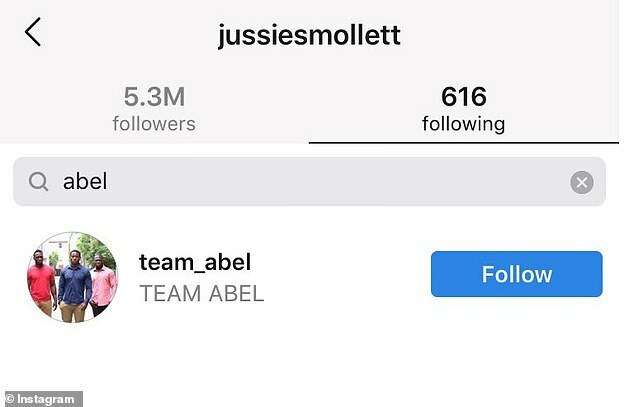 Reports of Smollett's attack draw outrage and support on social media, including from U.S. Senators Kamala Harris, Cory Booker, and Elizabeth Warren. Both Booker and Harris called the incident a 'modern day lynching'. Smollett's family issues a statement calling the attack a racial and homophobic hate crime. 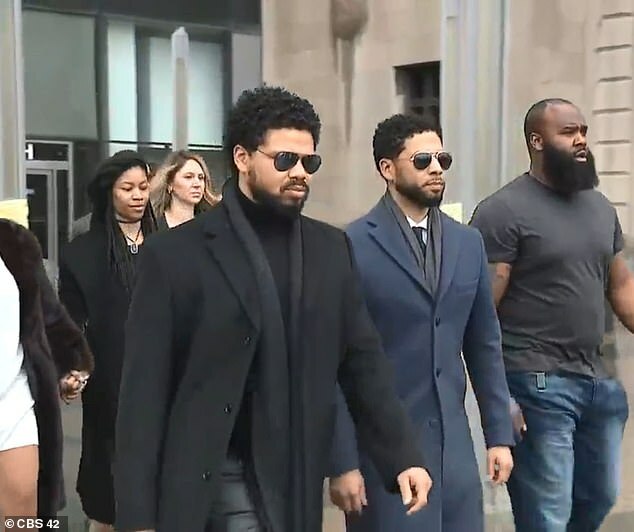 Smollett's family says he 'has told the police everything' and 'his story has never changed,' disputing assertions leveled on social media that he has been less than cooperative and changed his story. 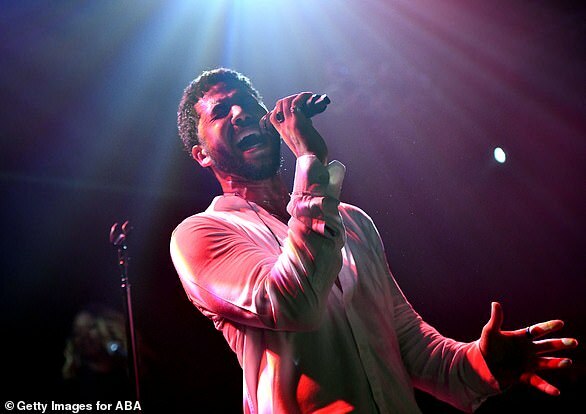 Smollett gives sold-out concert in West Hollywood, California, opening with an emotional speech, saying he had to play the show because he couldn't let his attackers win. At the end of the set, he announces that he fought back against his attackers, calling himself 'the gay Tupac'. Congresswoman Maxine Waters is in attendance at the concert. 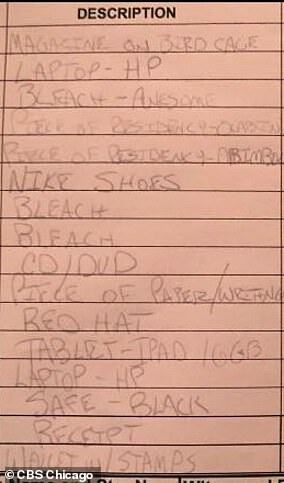 Brandon Z. Moore, his manager, gives police a screenshot to prove their call. February 11th: Smollett finally hands over redacted phone records to prove the phone call but police label them 'insufficient'. His neighbors say they don't believe his version of events. 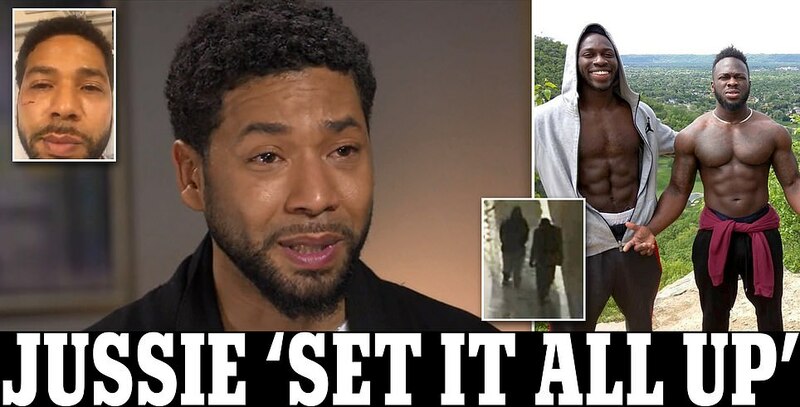 February 14th: Good Morning America airs the full interview with Smollett, in which he blasts speculation that the attack was staged as itself racist and hateful. Hours later, it emerges that two Nigerian brothers were picked up at Chicago's O'Hare Airport on their return from Nigeria the night before. 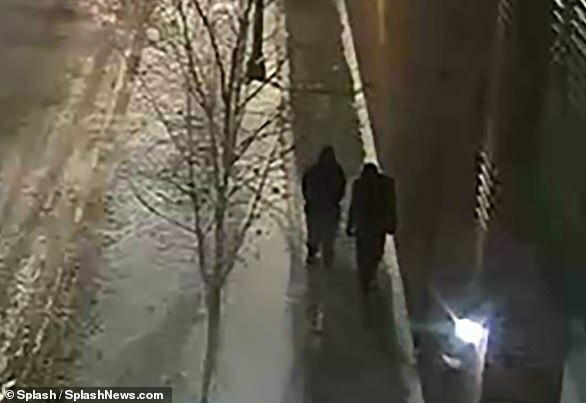 Cops identify the two men as the individuals seen in the surveillance images released from the night of January 29 but will not share their names. 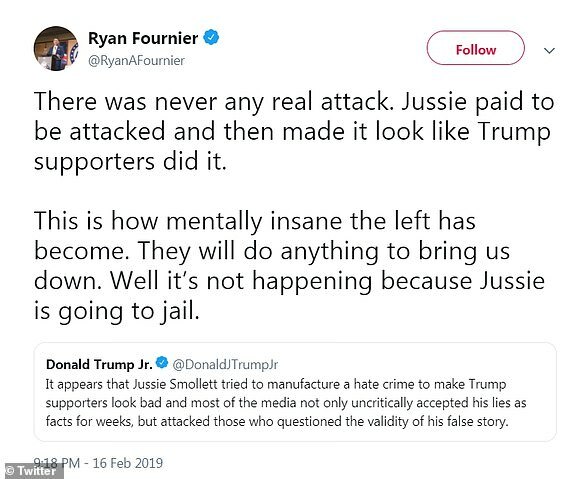 Two television stations in Chicago simul report the widespread belief among investigators that Smollett staged the attack as a hate hoax. Chicago's police superintendent later said that he had no evidence to prove that the attack was a hoax. Producers of 'Empire' dispute media reports that Smollett's character was being written off the show. High-powered criminal defense attorney Michael Monico reveals that he is representing Smollett. DailyMail.com confirms they are brothers Olabinjo 'Ola' Osundairo, 27, and Abimbola 'Abel' Osundairo, 25. Later, Chicago police spokesman Anthony Guglielimi says the two 'persons of interest' are now considered suspects. He says the men are in custody but have not been charged with a crime. Chicago police release two men without charges after arresting them on suspicion of assaulting Smollett and holding them for nearly 48 hours. A police spokesman said the two are no longer considered suspects and that investigators have 'new evidence' to consider as a result of questioning them. A police spokesman said that the investigation had 'shifted' after detectives questioned the two brothers about the attack and released them without charges. Smollett hired Michael Cohen's high-powered criminal defense attorney, Michael Monico, as the police investigation into the attack he reported last month took a sudden shift amid allegations of a hoax. 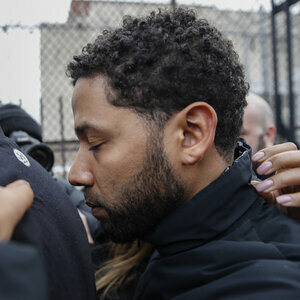 Smollett’s lawyers said on Saturday the actor felt 'victimized by reports he played a role in the assault, and that Smollett would continue cooperating with police. A police spokesman said that Chicago police have told Smollett’s attorneys they want to do a follow-up interview with the actor. A spokesperson for Smollett’s lawyers said she couldn’t comment on whether Smollett had agreed to another interview. 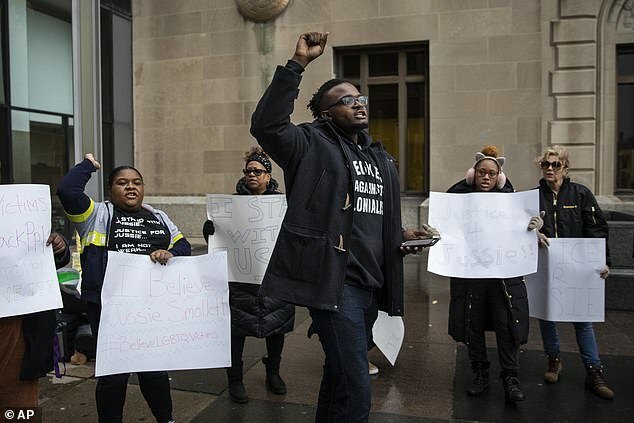 The Osundairo brothers speak with police and prosecutors in Chicago but are halted at the last minute before going to testify before a grand jury. 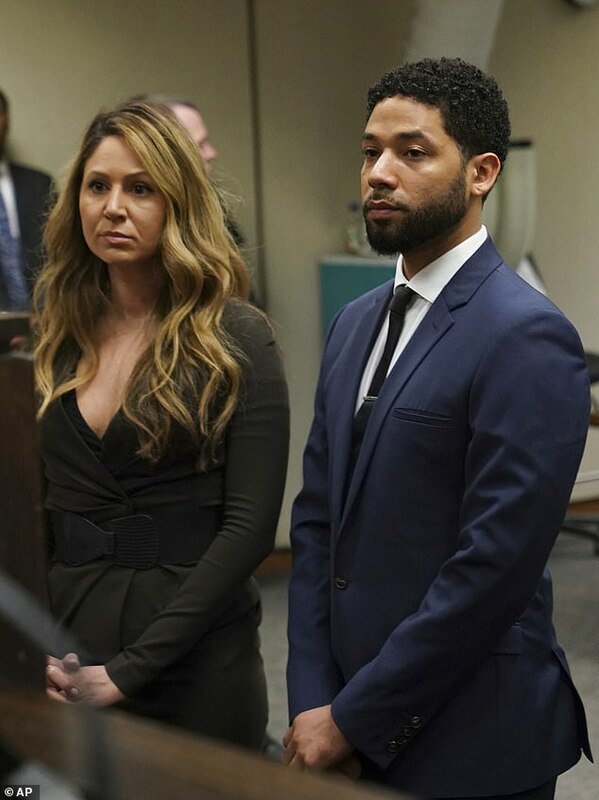 Fox says Smollett is not being written out of Empire contrary to reports and Smollett's co-stars speak out in support of him. He is named as a suspect later in the afternoon and the brothers are seen entering grand jury offices at the courthouse. Smollett is criminally charged with filing a false police report, a Class 4 felony which carries a maximum penalty of three years imprisonment and a $25,000 fine. Here is what we know so far about the alleged attack on Empire star Jussie Smollett and the ongoing investigation by the Chicago Police Department. Since CPD is not commenting citing the ongoing probe, the public has been left to rely on Smollett’s version of events. On January 29, Smollett was allegedly assaulted by two men at around 2am. Reports indicated that he was allegedly beaten up and had a noose tied around his neck. The alleged assault took place as Smollett was on his way home after buying a sandwich at a local Subway. Initial reports indicated that the attackers were ‘white men’ who yelled ‘This is MAGA country’ while yelling racist and homophobic slurs and pouring bleach on him. But during an interview with Robin Roberts of ABC’s Good Morning America, Smollett denied that his assailants wore red MAGA hats. Smollett also told Roberts that contrary to reports, his ribs were not broken as a result of the incident. After the assault, some began to wonder if Smollett concocted the entire story. That there were those who doubted Smollett stems from a number of factors. A Chicago Police spokesperson said on the day after the alleged attack that investigators were unable to find evidence of an assault. The only surveillance camera at the scene was pointed in the opposite direction. Smollett also phoned the police from his apartment rather than from the scene. When Smollett initially refused investigators’ request to hand over his phone, this raised eyebrows. Smollett then handed over his phone records, but they were redacted in order to protect the privacy of people not involved in the attack. On Friday, police arrested two Nigerian men in the connection with the attack - only to have them released later. 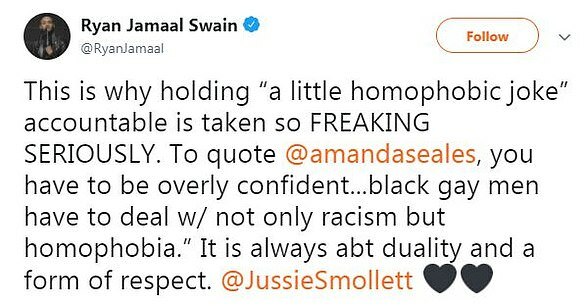 Since both men are black, this has led some to be suspicious of Smollett’s claim that this was a hate crime. 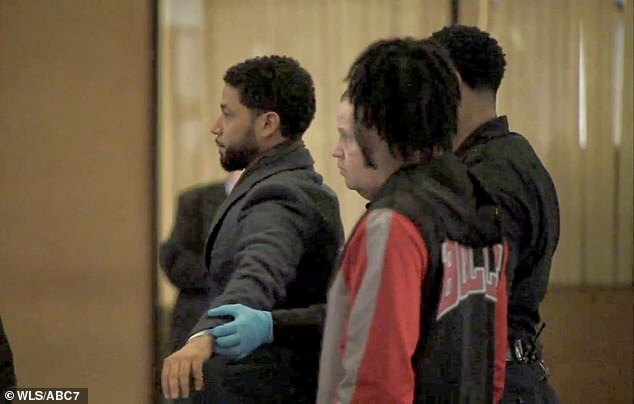 Information emerged later on showing that Smollett knew the two men who were arrested since they were extras on Empire. 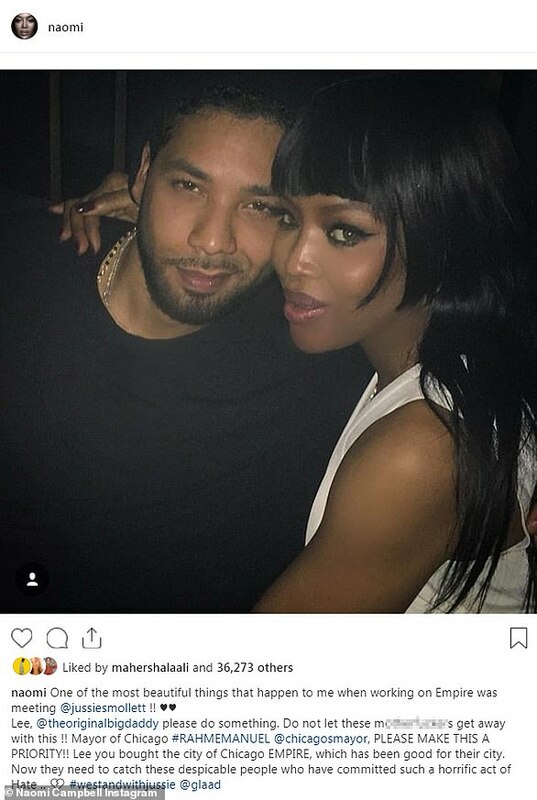 A theory floating around on social media stated that Smollett staged the attack because his character was being written off Empire. But the show’s producers and writers quickly refuted that claim. Police believe that the red hats were purchased at a local beauty supply store in the Uptown section of Chicago. 'We can confirm that the information received from the individuals questioned by police earlier in the Empire case has in fact shifted the trajectory of the investigation,' Chicago Police spokesperson Anthony Guglielmi said. Chicago police are now ‘eager to speak to Jussie Smollett’ in light of the new information that was uncovered, according to ABC News. ‘We have been in touch with Smollett's attorneys,’ a Chicago Police Department spokesperson said. 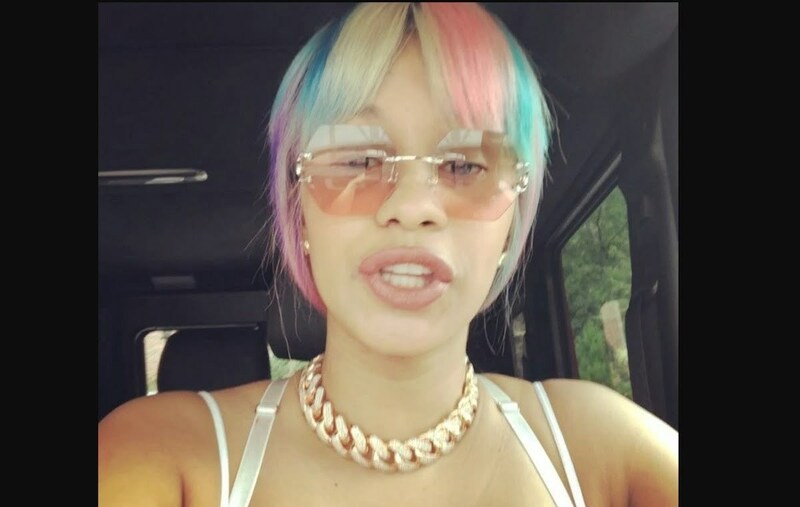 Marcella Edmmond Dude, typical of miserable black women.....cu.nt.s like you want to be manly until you get your azz served to you then you holler abuse------I see your asz is jealous of your mouth because of all the shyt that comes out of it. Get lost little girl and stop playing with yourself and you might find a man who can tolerate you you, for an hour without putting his foot up your azz ----CU>NT! El-Bull, girlfriend. you are comical to me, a clown. You are still a bitter, lonely, old lady. LOL! Unlike yourself, I am very comfortable and happy with ALL OF THE MEN in my life. I have a wonderful son that would make any mother proud and I have an exceptional, loving, and adoring husband who is the epitome of greatness. I support my men in what ever they want and need to be successful black men in this world. my son who is in his 3rd year of college, and my husband who earns a six figure salary seem to be doing just fine to me. I don't care that you are gay and I don't care about your outlook on life it's apparent that you are a miserable black man. If you were really confident in your manhood and sexuality, you wouldn't feel the need to insult, belittle, or berate ANY OTHER HUMAN BEING. You don't bother me because I am satisfied with my life and the lives of those i love.I find it hard to believe that you are truly happy with yourself and how you live your life. But that's neither here nor there. You work on yourself. Maybe staying off this blog may help because you really have nothing important or positive to add and your comments are useless. Ok sweetie, you have a beautifully blessed day and remember to be TRUE TO WHO AND WHAT YOU REALLY ARE. smooches!!!! marcella edmond---that's a typical weak reply from a c.un.t. like you. Bytches like you always think that by coming after a man's sexuality, that it diminishes him. Well C.U.N.T I'm secure in my manhood unlike your undercover boyfriend /husband if you have one-----I FEEL SORRY FOR ANY MALE CHILDREN YOU MAY HAVE AS I AM SURE THEY ARE ALREADY EMASCULATED TO THE PINT THEY ARE WEARING DRESSES. Hmmmm...I wonder if he is going to try and plead insanity and pay off an underpaid psychiatrist to say he has been getting treated for years unbeknownst to anyone in his family OR say he is on prescription meds that can make you delusional as a side effect. I cannot wait for this trial to started, they failed to convict R Kelly in Chicago so the prosecutor in this case is going to make an example out of him. 48years for lying?when we have real criminals get off with 2-4 years like really? El-Bull i never attacked you! And as for calling me out my name, like I said, you have a problem and you are lacking something. You spend WAY TOO MUCH TIME ON HERE ATTACKING PEOPLE. My brother people like you make me smile. LOL. Why do you remind me of a old lonely, bitter woman? LOL .You make me laugh every time you comment on anything or anyone. Simply comical to me. I question whether or not you are gay. Side eye. Wink. Wink. Lol!